I love spring and fall cleaning. There is something very empowering and cathartic about throwing old things out and reorganizing either a pantry or a closet. In with the old out with the new. This year, in addition to changing my closets over to my summer wardrobe, I decided to reorganize my entire kitchen. I have what is known as a galley kitchen – two long walls of cabinets and appliances and I have a large walk in pantry that has shelves all the way to the ceiling. The problem with my pantry is that the shelves are very deep and every time I wanted something I would have to remove the front items to find something that might be in the back. I am also a big bulk buyer – so I have HUGE containers of flour, sugars, cocoa, seeds, etc. 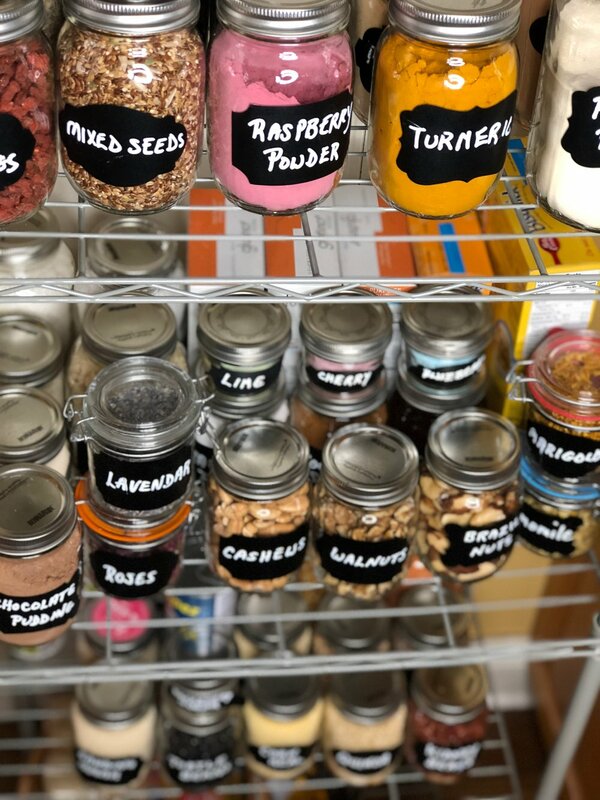 This year I decided to create an every day pantry. When I moved into my apartment 14 years ago I took a large walk in closet and converted it into my baking closet using industrial shelving. The shelves are long and not too deep. I have all the baking items, such as cookie cutters, organized by theme which makes it very easy to find something. I bought a narrow five shelf industrial shelving system from Amazon.com It comes ready to be assembled. I also bought large and small mason jars and erasable stickers also from Amazon. 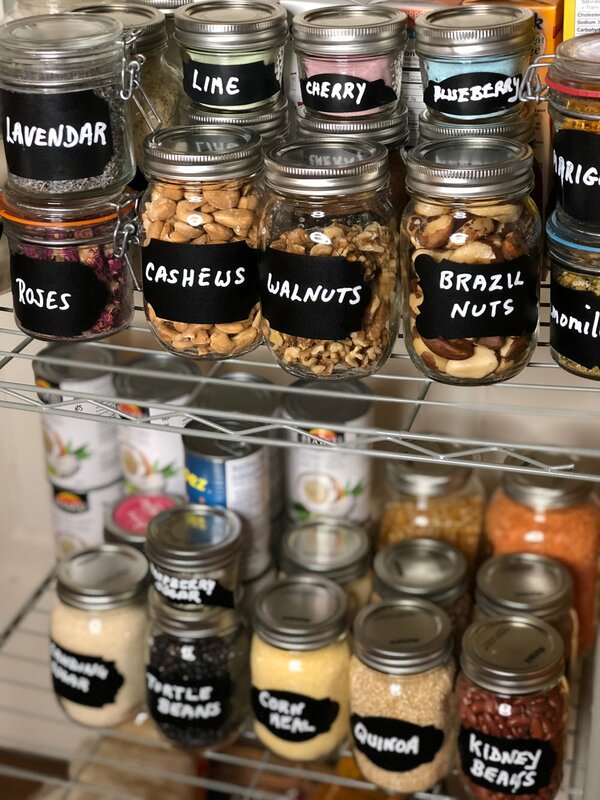 I like the size of these jars as there is just enough of each item but not too much. Shop waterproof labels like ours on Amazon. 60 waterproof and re-useable labels for 12.99 CAD. I divided the shelves by ‘theme’, as I did with my baking closet. 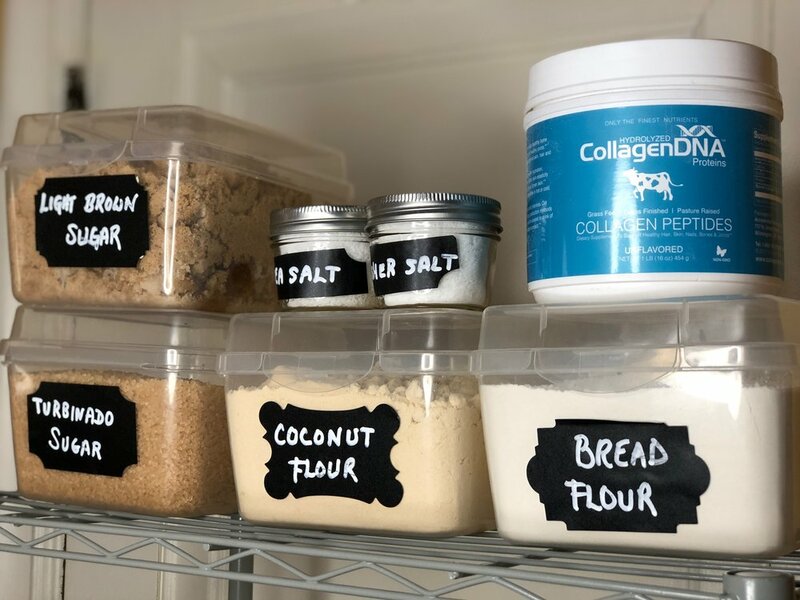 The top shelf has the flours and bread in large quantities that I use most frequently. These are Turbinado sugar (pure sugar cane extract), brown sugar, coconut flour and bread flour. The second shelf has the items that I used the most frequently for smoothies or smoothie bowls. Protein powder, seeds, adaptogens, flavorings such as organic raspberry powder, unsweetened cocoa powder and dried berries, etc. 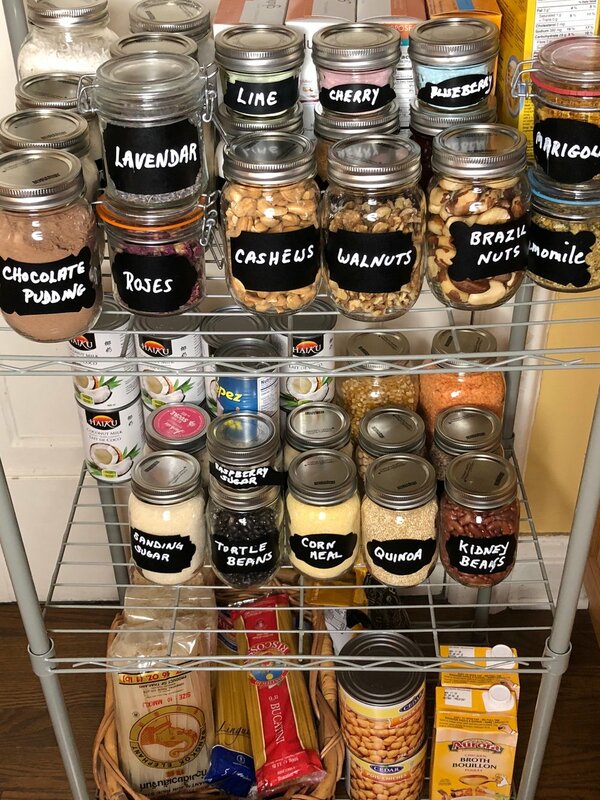 The third shelf has my nuts, my organic flowers that I use in pastries, flavorings for puddings, and panna cotta and all my gluten free flours. The fourth shelf has all my beans and coconut oils and milks. The fifth shelf has the rice noodles, pasta, cans of chick peas and chicken stock. This is also the shelf that I put potatoes and onions on. Remember to pick themes that work for you. If mine don't, create your own. Maybe dividing things by meal or cuisine will work better for you. By having everything within easy reach I find I can be much more efficient in the kitchen. After all the way you organize your kitchen is supposed to make the way you cook and prepare food more convenient. Customize it to what works for you so that making healthy food is a breeze and everything is easy to access! Happy organizing!